Cybercrime: VPNs ensure security of your data and systems. With more and more people opting for cashless transactions, online frauds are also on the rise. Cybercrime around the globe is growing exponentially. We constantly come across the news on such online frauds. However, cybercrime is much more than an online financial fraud. The hacker may take control of your email account and ask for ransom. For example, the latest WannaCry ransomware attack. This scam moved the IT sector and raised a lot of questions about cyber security. A recent study by experts at IIT-Kanpur, India, highlights how cybercrime is on the rise. The experts believe that India has to buck up and upgrade the security against such crimes. It is worth noticing that apart from individuals, small businesses are also becoming the target point for such crimes. According to the Indian Computer Emergency Response Team (CERT-In), 50 incidents of cybercrimes took place between November 2016 and June 2017. These crimes affected 19 financial organizations. If one wants to stay safe, it is always better to learn from these incidents. Nevertheless, you can always make sure that your data, systems and identity, are safe all the time. And that’s very much possible with a virtual private network or a VPN. Some common habits can save you from big frauds. We understand that it is very crucial that the user knows the safety measures. Here are some tips, which any online shopper should keep in mind. Go for two step verification. If shopping online, make sure to use secure sites with “https” in the address bar instead of “http”. Avoid using a common password for multiple websites. Rather, opt for different passwords for different websites. Try not to save your credit card details on the websites. This is like inviting a risk. A virtual private network or a VPN is a very popular and an affordable method to guard you against any type of cybercrime. If you are using a VPN, your connection is more secure. It is easy to target your personal emails or important data when you are using a Wi-Fi. But a VPN encrypts your data before sending it over the internet. Also, keep in mind to choose your VPN service provider wisely. Do not get wooed away with the catchy offers like free or a cheap VPN service. The one reliable VPN service provider in the market is Le VPN. Le VPN improves your online security in many ways. It encrypts your internet connection with a top-secret level cipher. As a result, hackers cannot reach your vital data. Le VPN also uses the AES-256 encryption algorithm. AES means Advanced Encryption Standard. The larger key size of AES-256 is a guarantee that a hacker cannot decrypt your data, even if our servers get hacked. When you use a VPN with AES-256 encryption algorithm, your internet speed is not compromised. The reason is that the AES-256 is extremely fast. Le VPN also offers customized apps for android, iOS, and Mac. You can easily install Le VPN’s Android app on your smartphone and ensure the mobile security. We generally connect via a public Wi-Fi while on the go. This makes our sensitive information vulnerable for theft. However, you can leave apart these worries with Le VPN. 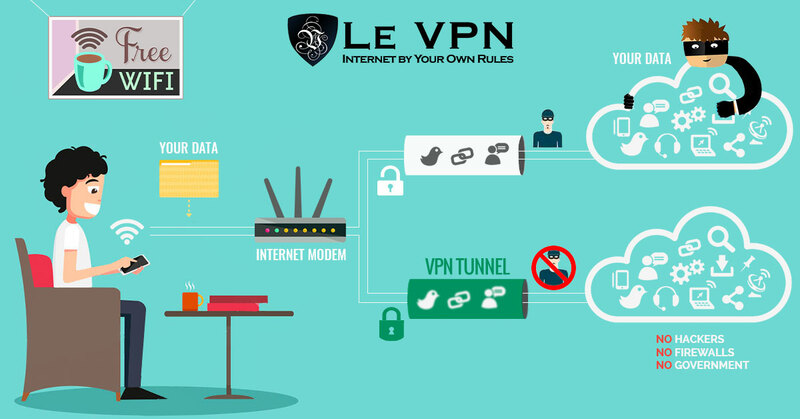 So, enhance your security against any cybercrime with Le VPN.